Local residents from San Dionisio del Mar (Isthmus of Tehuantepec, Oaxaca, Mexico) are protesting the construction of a huge wind farm in their community. Their prolonged and energetic resistance has been met with violent repression and even death threats made against several opposition leaders. 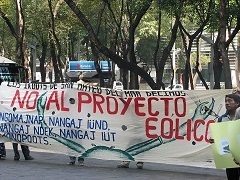 In addition, protestors say that they were not told of potential environmental impacts of the projects when the companies initially informed them about development, nor that existing wind farms have negatively impacted the livelihoods of communities where they are located, including impeding their ability to cultivate their lands. In this regard, the Mexican government failed to fulfill its responsibility to create a process that permits and ensures the free, prior and informed consent of indigenous communities with regard to projects that directly affect them, as required by national and international law. Take action in support of the community today.